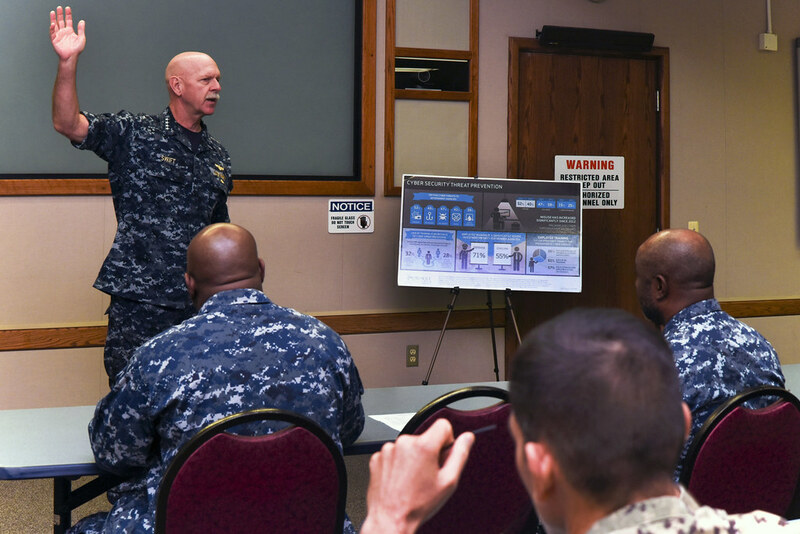 PEARL HARBOR – Cybersecurity leaders from Pacific Fleet commands discussed new cybersecurity practices during the U.S. Pacific Fleet 2017 Fleet Cybersecurity Waterfront Training Symposium held at PACFLT headquarters Feb. 13-16. According to Space and Naval Warfare Systems Command (SPAWAR) website, cybersecurity involves a range of situations, capabilities, and threats. Attacks such as viruses and worms, malware and trojans have grown in sophistication over the recent years. These types of challenges can affect many aspects of daily life – transportation, essential utilities, finances, and communications just to name a few. With more than 130,000 active duty personnel, 200 ships with over 20 percent of them deployed across the world at any given time, PACFLT’s ability to operate in cyberspace securely and confidently is critical to mission accomplishment. “We must remember that we are in a battlespace at all times. Cyber is a wartime environment. We need to be more thoughtful about how we identify and manage cyber risks. This is not a spectator’s sport. The best defense is a good offense,” said Swift. In the age of rapid technological growth and expanding cyber connectivity, optimizing training opportunities like this maximizes combat effectiveness and efficiency in information security, which is a major consideration in the minds of senior leadership of every global organization.